Chief Minister Pema Khandu today released a coffee table book ‘Ecotourism potential and Forest Rest Houses of Arunachal Pradesh’. 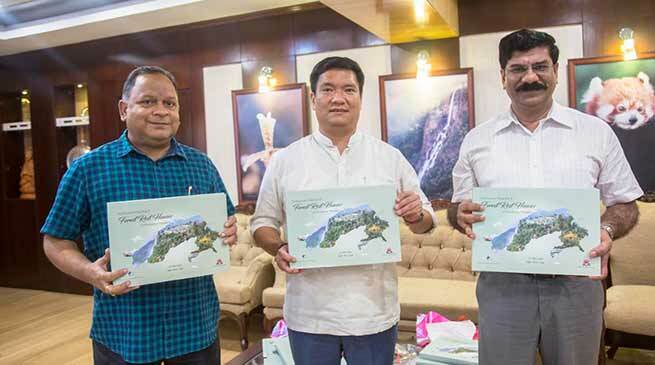 Chief Minister Pema Khandu today released a coffee table book ‘Ecotourism potential and Forest Rest Houses of Arunachal Pradesh’ today published by department of forest & environment. Congratulating the department for bringing out the book, the Chief Minister said this initiative will promote Eco-tourism in the state apart from giving an overview of the rich bio-diversity of Arunachal. He also said the forest rest houses managed by forest department can become a big tourist draws and the book has complete information on guest houses spread across the state.